Dismissing criticism by cynics and opposition leaders, President Maithripala Sirisena on Wednesday, assured that effective and immediate legal action would be taken against those facing serious charges in the report of the Presidential Commission, which probed the Central Bank bond transactions from February 1, 2015, to March 31, 2016. 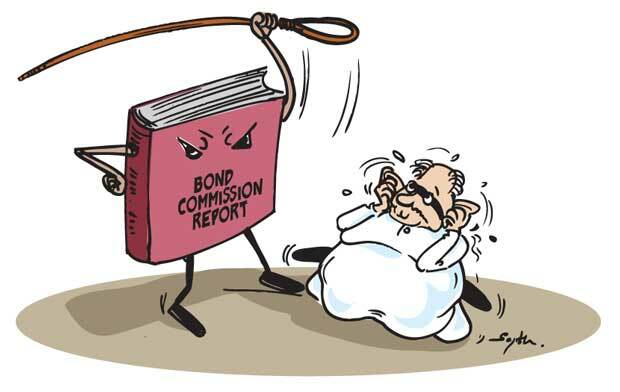 The Commission has made charges of unethical conduct by the Central Bank’s former Governor Arjuna Mahendran. It also revealed that Perpetual Treasuries Ltd. involving Mr Mahendran’s son-in-law Arjun Aloysius had made a staggering profit of more than Rs. 11.1 billion from the bond transactions. The Commission has recommended that criminal or civil action must be taken against them to recover the public money plundered and other penalties also imposed against them. The Commission in its 1,257-page report has also included annexures and recommendations. The President in his summary said the report had been handed over to the Attorney General’s Department and the Criminal Investigations Department. Making clear that unlike in previous years, when Commission reports ended up on some shelf, President Sirisena said he would submit this report to Parliament so that it would be a public document and also introduced some bills to ensure that the plundered public money would be repaid. The Commission had also pointed out that there was evidence that such illegal bond transactions had taken place at the Central Bank from 2008 to 2014 also, and action should be taken to probe them and recover the plundered billions. In the summary carried live on television and radio, President Sirisena also referred to the Commission he had appointed to investigate and inquire into Serious Acts of Fraud, Corruption and Abuse of Power, State Resources and Privileges (PRECIFAC). This Commission, which carried out the investigation for about two-and-a-half years, has handed over 34 reports to the President. Already 17 of these reports had been handed over to the AG’s Department for necessary actions through relevant institutions. By now, the Fraud and Corruption Commission, institutions, departments and Police have taken actions to file cases based on the facts of these reports. The President assured action would be taken soon on the recommendation of the Bond Commission Report. Among others, the Commission has referred to the allegation against former Minister Ravi Karunanayake regarding the payment of rent for the penthouse apartment belonging to the Aloysius family and their Walt and Rowe Company. It said Mr Karunanayake was responsible for that and recommended that the government should take necessary action against him under the Bribery and Corruption Act and further legal action under the Penal Codes for giving false evidence to the Commission. Opposition leaders have been charging that Prime Minister Ranil Wickremesinghe who had recommended the appointment of Mr Mahendran as Central Bank Governor in January 2015 should be held responsible for what happened. But the Commission in its report said the PM’s responsibility in the appointment of Mr Mahendran was proper. The Commission said the PM had made statements in Parliament regarding the appointment of Mr Mahendran believing in the facts presented by Mr Mahendran and the promises made by him. The Commission says the PM should not have done that. We hope the tough action during next few months against those involved in corruption, bribery and serious frauds will help reduce and gradually end corruption in politics and those entering the political field will commit themselves to give what they can to the country, instead of trying grab.